Gorbachev’s accession to General Secretary promised great changes to the Soviet Union and its relationship with the rest of the world. This book, first published in 1987, discusses the problems faced by Gorbachev when he entered office and how he planned to tackle them. Gorbachev was a figure of genuine debate in the mid-1980s, raising doubts from Western specialists regarding his radicalism and ability to reform the Soviet economic system in particular. 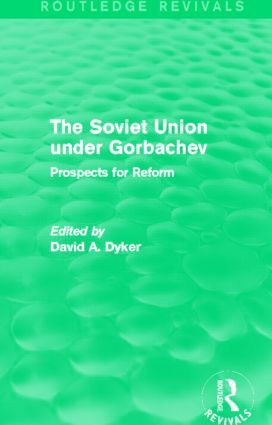 Here, Dyker and his colleagues assess the changes Gorbachev had already made to consolidate his power base, alongside those that he was proposing to make to agriculture, industry and foreign relations at the time of publication. The book speculates about how Gorbachev might implement his proposed political and economic reforms, what opposition he might encounter and how successful he would be. A fascinating insight into Soviet economic and political policy in the years leading up to the Union’s collapse, this work will be of particular importance to students and academics researching the personality of Gorbachev and the political and economic history of the Soviet Union.